The New Zealand Mint’s Warriors of History Series seeks to honor the warriors of legend. Many of the historic groups of warriors are known for their bravery and special battle tactics. Now, you can own a coin that honors some of the most famous warriors in history. 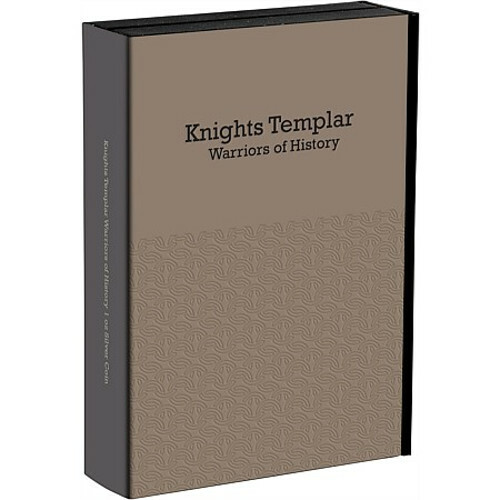 Right now, the 2017 1 oz Silver Niue Warriors of History Knights Templar Proof Coin joins the program and is available to purchase online at Silver.com. 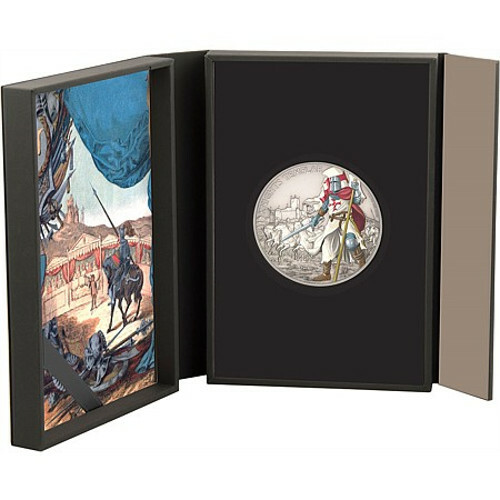 Ships to you in a themed rectangular coin case with textured cover and Certificate of Authenticity. Fourth coin in the Warriors of History release! Mintage limited to 5,000 coins only! Obverse bears Queen Elizabeth II’s effigy. Reverse includes the colorized image of a Knights Templar soldier. The Knights Templar were first established during the Crusades to protect Christian pilgrims as they traveled to the Holy Land, keeping them safe from the turmoil that engulfed the region at that time. The Knights wore distinctive uniforms consisting of a white tunic with a blood-red eight-pointed cross on the front. Each member of the Knights Templar had sworn to die for their faith. As the fourth release in this collection, the Knights Templar coin joins the previous releases honoring the prowess and superior battlefield abilities of the Samurai, Viking warriors, and the Roman Army. Like the rest of the coins in the series, these all have a unique antique finish that makes the coins look older than they actually are. On top of this unique finish, each coin also has part of the design in full color to make the warrior really stand out. All of these coins will ship in a display box with a Certificate of Authenticity. The certificate features a one-of-a-kind production number that is unique to each individual coin. 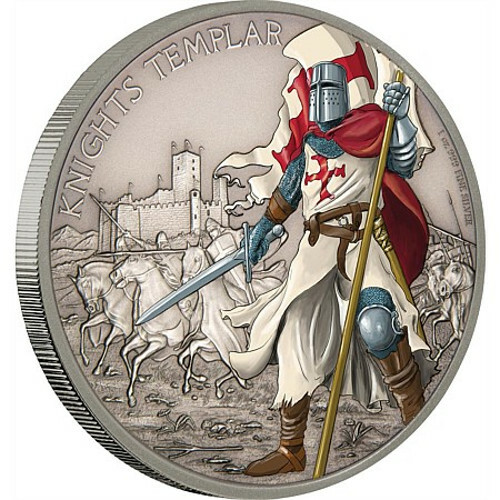 On the reverse of the Knights Templar Coin you’ll find the image of soldier from the Templar Order. His full-color uniform is brilliantly visible, and set against the antique-finished background that depicts the Knights Templar as they ride their warhorses into battle. 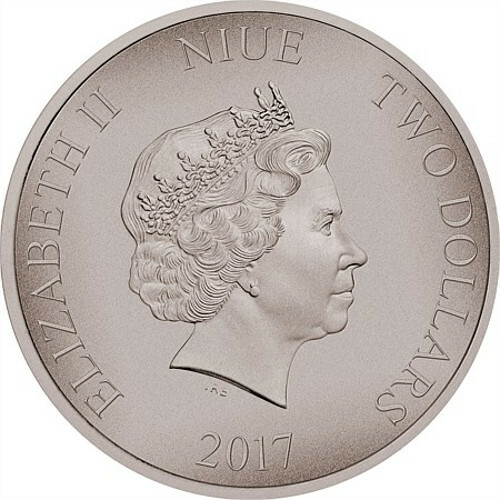 The obverse of the 2017 1 oz Silver Niue Warriors of History Knights Templar Proof Coin features the right-profile effigy of Queen Elizabeth II. Her Majesty appears on the obverse of all commonwealth coinage, with this current depiction from 1998. It was created by Ian Rank-Broadley as the fourth-generation depiction of the Queen. If you have any questions, please feel free to contact Silver.com. Our customer service team is available on the phone at 888-989-7223, on the web using our live chat, and via our email address.